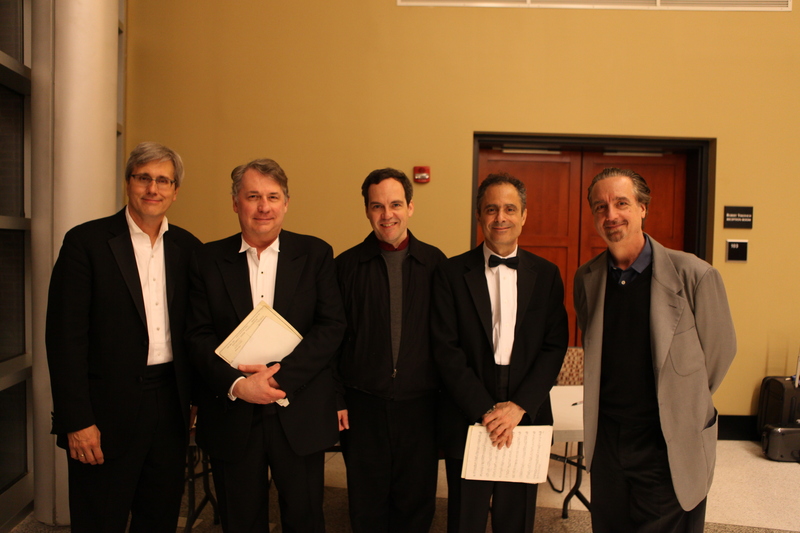 with the Emerson String Quartet after the premiere of String Quartet No. 5: Through the Night. With commissions, performances and recordings by the Emerson, Daedalus, Cassatt, Borromeo, American and Mendelssohn String Quartets, Lawrence Dillon has been recognized as one of his generation’s foremost composers of string quartets. In The Invisible Cities String Quartet Cycle, Dillon has addressed the formidable tradition head-on, creating compositions that focus on contemporary ramifications of Classical forms. The Invisible Cities String Quartet Cycle is a set of six quartets, each centering on a different traditional form. In the same way in which the cinematic close-up can reveal more than any dialogue, with close focus each of these forms reveals a wealth of possibilities and a surprising relevance to contemporary thought and experience. The quartets also bring into focus the points at which Classical forms break down under the weight of contemporary expression. This tension between coherence and chaos is a recurrent expressive feature of the cycle. Brief descriptions of each quartet follow. Click on the titles for more details, including sound and score samples. The focus of the first quartet is the Classical scherzo, or “joke.” Approaching the scherzo through the eyes of contemporary psychology and anthropology, Jests and Tenderness explores the fine line between rage and humor, with three increasingly agitated scherzi followed by a serene nocturne. The second quartet focuses on the literal meaning of the word fugue (flight) with six brief fugues, each depicting flight from a different perspective, from the inspiring magnificence of nature to the lethal manipulations of manmade aircraft. The six movements are titled Birds, Insects and Paper Airplanes, Stars, Langley, Swings, and Daedalus and Icarus. The shortest of the six quartets, Air is in five continuous movements (Aura-Aria-Air-Aria-Aura) totaling just over ten minutes. The centerpiece is a passionate, Italian-influenced aria, with florid ornamentation of pitch, tempo and timbre. Taking Pascal’s reference to an “infinite sphere whose center is everywhere and whose circumference is nowhere” as a starting point, this fourth quartet explores the potentials of Classical circular forms and techniques – in particular the rondo form and canonical rounds – pitted against the chaos of infinity. The fifth string quartet is based, literally and figuratively, on the Welsh tune “All Through the Night,” using an assortment of variation techniques to take the listener on a journey through the night. String Quartet No. 6: Rapid Eye is a rumination on the musical, literary and cognitive meanings of fantasy in two movements: Adrift and Ashore.